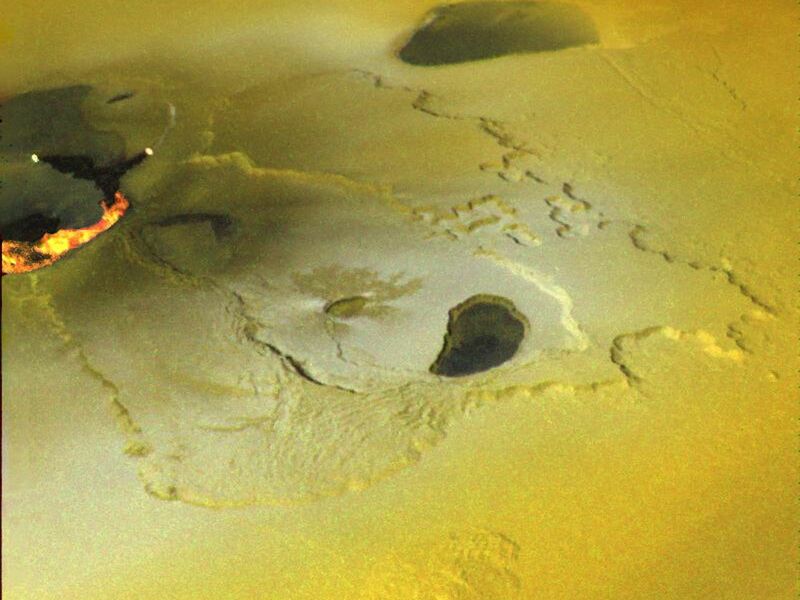 An active volcanic eruption on Jupiter's moon Io was captured in this image taken on February 22, 2000 by NASA's Galileo spacecraft. Tvashtar Catena, a chain of giant volcanic calderas centered at 60 degrees north, 120 degrees west, was the location of an energetic eruption caught in action in November 1999. A dark, "L"-shaped lava flow to the left of the center in this more recent image marks the location of the November eruption. White and orange areas on the left side of the picture show newly erupted hot lava, seen in this false color image because of infrared emission. 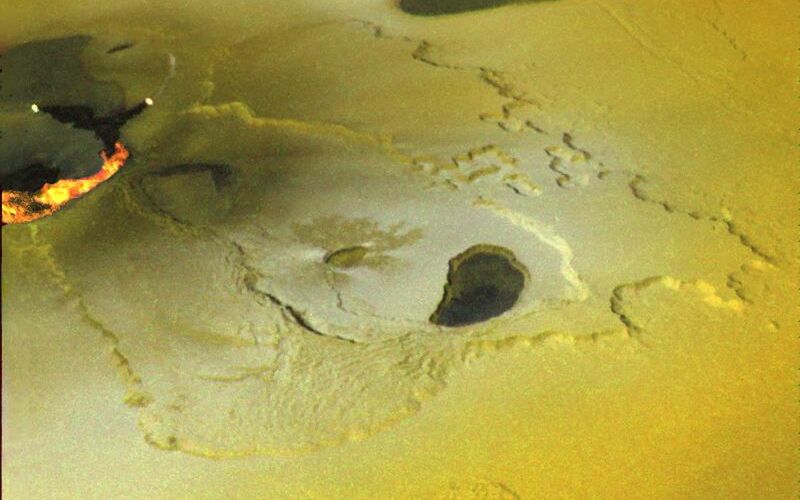 The two small bright spots are sites where molten rock is exposed to the surface at the toes of lava flows. 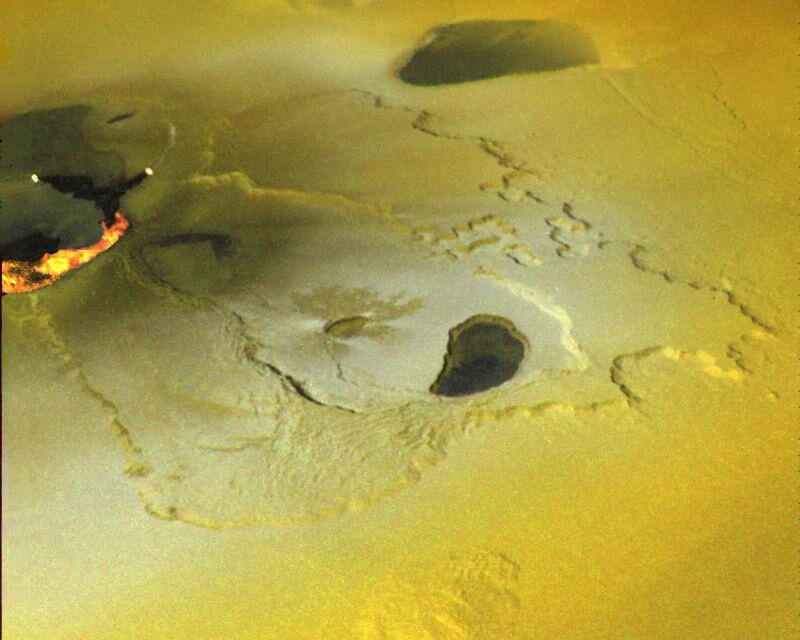 The larger orange and yellow ribbon is a cooling lava flow that is more than more than 60 kilometers (37 miles) long. 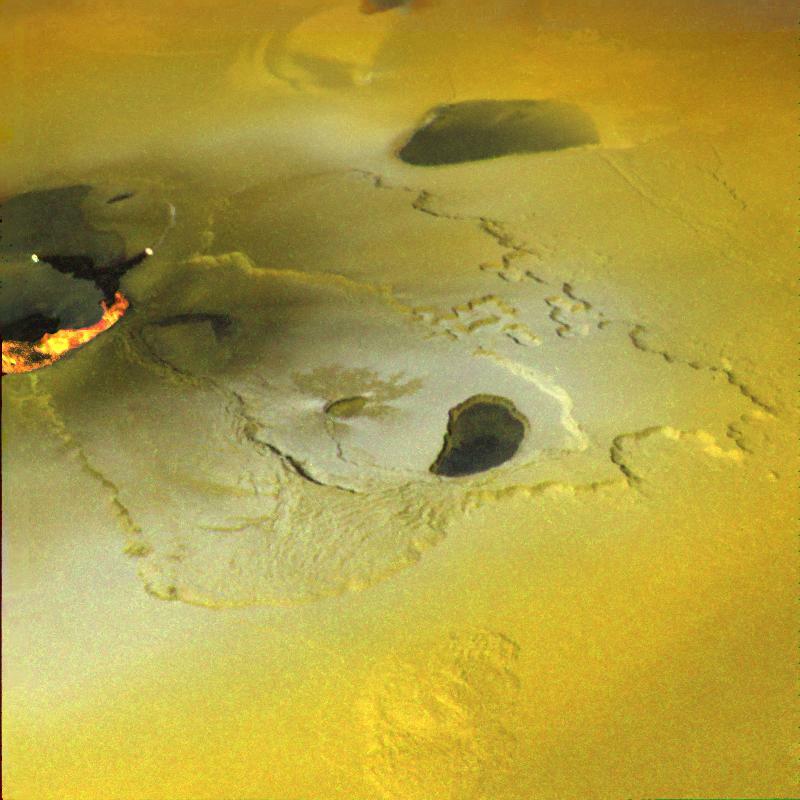 Dark, diffuse deposits surrounding the active lava flows were not there during the November 1999 flyby of Io. This color mosaic was created by combining images taken in the near-infrared, clear, and violet filters from Galileo's camera. The range of wavelengths is slightly more than that of the human eye. The mosaic has been processed to enhance subtle color variations. The bright orange, yellow, and white areas at the left of the mosaic use images in two more infrared filters to show temperature variations, orange being the coolest and white the hottest material. This picture is about 250 kilometers (about 155 miles) across. North is toward the top and illumination from the Sun is from the west (left). This image and other images and data received from Galileo are posted on the World Wide Web, on the Galileo mission home page at http://solarsystem.nasa.gov/galileo/. Background information and educational context for the images can be found at http://galileo.jpl.nasa.gov/gallery/io.cfm.